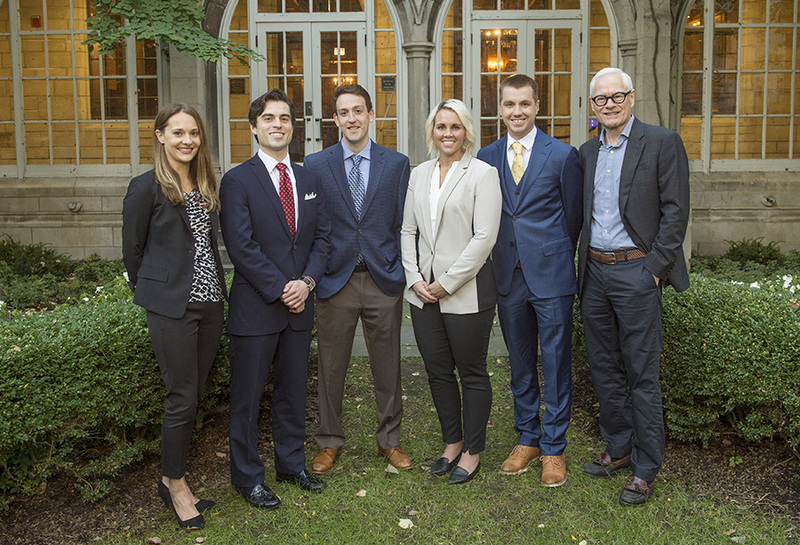 The Tax Lawyer student editorial board members (from left) Katie Cooperman, William Walsh, Charles Filips, Allyssa Depew, and Nicholas Bjornson with faculty editor David Cameron (far right). The ABA Tax Section announced last spring that it would end its 50-year partnership with Georgetown Law and start working with Northwestern’s Tax Program, which has ranked fourth annually in U.S. News and World Report since 2005, only three years after the program’s establishment. Professor David Cameron, associate director of the LLM Tax Program, now serves as faculty editor of the journal. Cameron, along with Professor Philip Postlewaite, director of the LLM Tax Program, recognized the opportunities the journal would bring — both to attract top talent to the highly-ranked program and to provide an exceptional learning opportunity for students. The journal has a student editorial board of five, all of whom receive full scholarships to Northwestern Law, and a staff of an additional twelve students, which means over one-third of the LLM Tax Program’s approximately 40 full-time students will end up participating. Charles Filips (LLM Tax ’19), one of the student editors, decided to apply to Northwestern’s LLM Tax Program after taking on many tax assignments at Kemp Klein Law Firm in Detroit. Balancing editorial responsibility with the yearlong program isn’t easy, but it’s good preparation for the real word, says editor Katie Cooperman (LLM Tax ’19). Students say that working on articles by some of the biggest names in tax law make the long hours worth it. For example, the Fall 2018 issue features articles by Michelle Jewett, partner at Stroock in New York City, discussing the circumstances in which a transaction will be treated as a redemption rather than a sale of a partnership interest; Jeffrey Hochberg, partner at Sullivan & Cromwell in New York City, examining recently promulgated regulations that address the tax implications of contracts that reference a financial index; and Monica Gianni, Of Counsel at Davis Wright Tremaine in Seattle, criticizing the OECD’s failure to respond to tax issues arising in the digital economy. The Fall issue also includes an article by Herbert Beller, a senior lecturer in Northwestern’s Tax Program, recommending amendments to § 355’s requirements applicable to corporate spin-offs. Beller, a former chair of the ABA’s Tax Section, was instrumental in bringing The Tax Lawyer to Northwestern Law. The collaboration with the ABA Tax Section offers the editors — all of whom had journal or law review experience during their JD programs — extra support as they delve into highly technical and often unfamiliar topics. The Tax Lawyer is available online.